Santa Barbara's beloved illustrator releases her third children's book and holds a solo art show at The French Press through December. December is proving to be a big month for Molly Hahn. In 2011, the Santa Barbara-based writer, illustrator, and multimedia artist chose to take a break from exhibiting (something she hasn’t done in more than five years) to focus on new projects. Lucky for us, the fruits of her labors are being unveiled just in time for the holidays. On Thursday, December 8, Hahn returns to the fold with a collection of new works and multimedia surprises, which will hang at The French Press (1101 State St.) through the end of the year. In addition, December 5 marks the official release of Hahn’s third children’s book, for which she’ll hold a signing at Santa Barbara Sheet Music (1036 Santa Barbara St.) on Saturday, December 10. For the unacquainted, Hahn’s work can best be described as whimsical. Her illustrations, whether dark or light in subject matter, are rich in color and imaginatively executed. 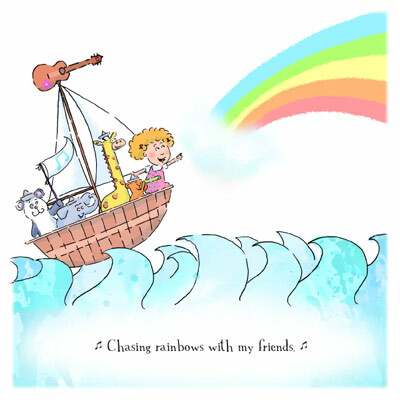 And her books, including the latest, Izzy’s Ukulele Adventure, evoke the kind of wide-eyed curiosity often associated with luminaries like Dr. Seuss and Peggy Parish. For Izzy, Hahn, who goes by the nom de plume Mollycules, and coauthor Ethan Turpin built on the foundations created by her previous works (mainly, themes of self-empowerment, creativity, and community-mindedness) to tell the story of one little girl’s discovery of and relationship with music. Based loosely on Hahn’s experience with Jack and Kim Johnson’s youngest daughter, Izzy is precocious but also determined and thoughtful, pushing through troubles to succeed on her instrument. An art opening for Hahn’s solo show at The French Press takes place this Thursday, December 8, from 5-7 p.m. A book signing for Izzy’s Ukulele Adventure will be held at Santa Barbara Sheet Music on Saturday, December 10 from 11 a.m.-2 p.m. For more on Hahn, or to order the book, visit mollycules.com.